← Neatening up a Rhododendron after it Blooms. Well, if you are reading this post, then you want to know the best ways to arrange your decorative accessories (knickknacks and collectables) to show them off in their most favorable light. Many people have collections. They could have collections of ceramic dogs, plastic frogs, Chinese blue and white porcelain, the list could go on and on. When putting together a tablescape there are two ways to assemble your display. First you could put together a collection of similar items, like the collection of ceramic dogs, or plastic frogs. Secondly you could assemble a collection of unrelated items, that are tied together by the color(s) they possess. Look at illustration 1. This arrangement all centers around the colors mint green, gold, and peach. All three of those colors are on the carved wooden duck, which is nesting in the peach colored fruit bowl. Two matching peach candle sticks flank the duck and bowl. Look at how the mint green on the duck’s back is now on the domed votive candle holder. This whole display is on a cream/gold, peach and mint green table runner. 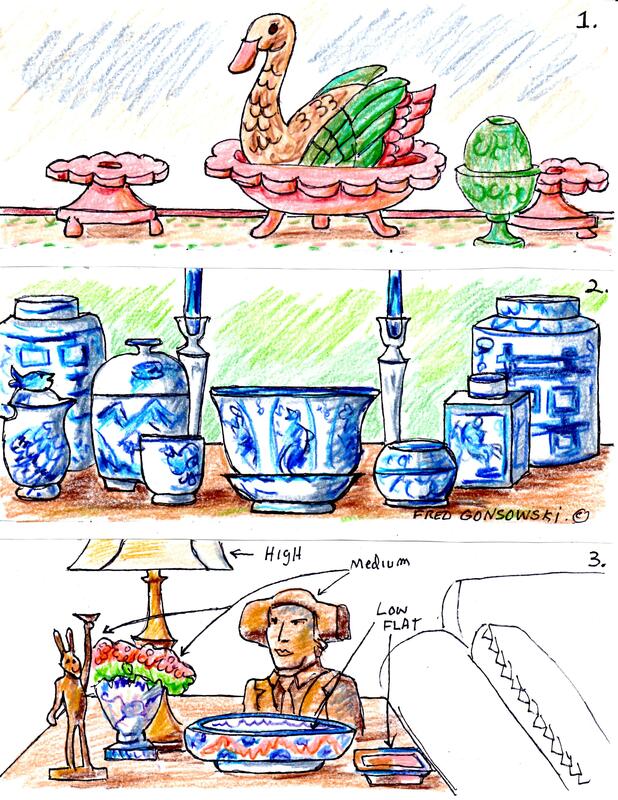 Illustration 2 shows a collection of Chinese blue and white. What both of the tablescapes have in common, is they are made up of elements/decorative home accessories that are Tall, Medium Height, Low, and Flat. Look at illustration 3. Illustration 3 shows an arrangement that could be on an end table on the left side of a sofa. The table lamp is the tallest piece in this arrangement. The bronze bust of the Matador, rabbit candle stick, and fan vase with flowers are in the middle height range. The Chinese bowl is the low item, and the ash tray is the flat. Directed Movement of Objects …All objects have a naturally directed movement, which leads your eye from one place to another. It could be right, center, or left. Illustration 4 shows a water pitcher and an armillary. In this illustration both objects have a right directed movement. The water pitcher’s spout (points) directs the movement right, as does the arrow on the armillary. Illustration 5, the statue of the girl, her body is facing forward, but her head is turned to the left, and she is looking left. She has a left directed movement. She would be best placed on the right side of an arrangement, looking toward the center. 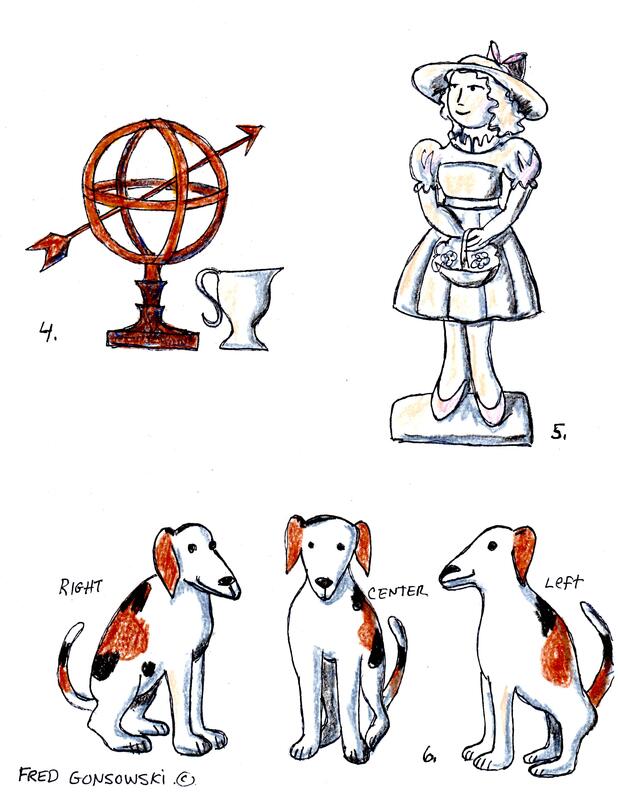 Illustration 6, the dogs, shows how the same item, depending on which way you position it, has a right, center, or left directed movement. When making an arrangement on a fireplace mantle, dining room buffet, or coffee table try to assemble your knickknacks so there is center focus. Center focus is all elements turned, or positioned so their natural directed action is directed to the center of your tablescape. Elements that possess right directed movement, should be placed on the left side, looking toward the center. All items with left directed movement should be placed on the right, looking left toward the center of your display. And all things that look to have neither right nor left directed movement should be in the middle of your tablescape. So now you have an idea about making tablescapes with your decorative accessories. Next look through decorating magazines and study how the pros do theirs. There is a difference between seeing something and thinking it is appealing, and knowing why it is appealing, because of how it was assembled. Hanging Pictures over a Sofa 9-12-2011. This entry was posted in Hanging Pictures and Mirrors / Arranging Knickknacks and Collectables, Interior Decorating Principles. Bookmark the permalink. You are a genius and I love you. You are the go to arbitrator between my husband..who thinks less is more..and I who thinks less is a bore. Would you someday write about accessorizing a long sofa table which is the first thing one sees upon entering…the sofa floats perpendicular to the fireplace…table items visual front and back….lamps no option as no floor outlet and I already have candle sticks all over. Sigh…. Happy New Year in Super Abundance to one who simplified my Christmas tree lighting this year. Happy 2015 to you Mona and Token, I will think about your request. I will have to put it on my list of topics to write about in 2015. Less is more, or more is more, that is the question. I think there is a fine line between too much and too little. I’m a person who likes things to look at (details), but too many things make me nervous. Everyone is different with what they think is right. I do know, too many things, even it they are really pricy can become a lot of junk, when they are all competing with each other for predominance in a grouping. I’ve known people, who came from nothing, and to over compensate, when they got money, bought too many things to say they had arrived. But in the end, if it makes the person feel OK, that is all that matters, as their eyes will be viewing it. Ahhh….Token concurs. He would rather see a lot of negative space around our few really nice objects than lots of objects! Must be a guy thing, so I think I must have a garage sale soon! Your use of accessories to build bridges between table and wall has worked out wonderfully well, how logically you present everything. However, with the large sofa table the wall is mere space….my bridge to no where! I have followed your suggestions of looking at magazines, but they do not compare to your splendidly well reasoned “meaty” writings….of which I am eagerly awaiting more. Hi there Mona, I think a lot of people buy too small things, versus having larger pieces that really make a statement, that is why I feel too many things assembled together can be overwhelming. When I get past a few more things, I will try to write a post about decorating a sofa table. I will look through magazines and books, and see if there is a repetitive pattern for decorating a table, and I will present my finds.